Submitted photo Left to right, Capt. Tim Shaw, Capt. John Lipscomb, Staff Sgt. Dakota Herndon and Tech Sgt. Matt Paris and from the 88th Air Base Wing Judge Advocates office, are growing mustaches in support of Mustache Movember. Movember is an annual event of growing mustaches during the month of November to bring awareness to men’s health issues such as prostate, testicular cancer and mental health. 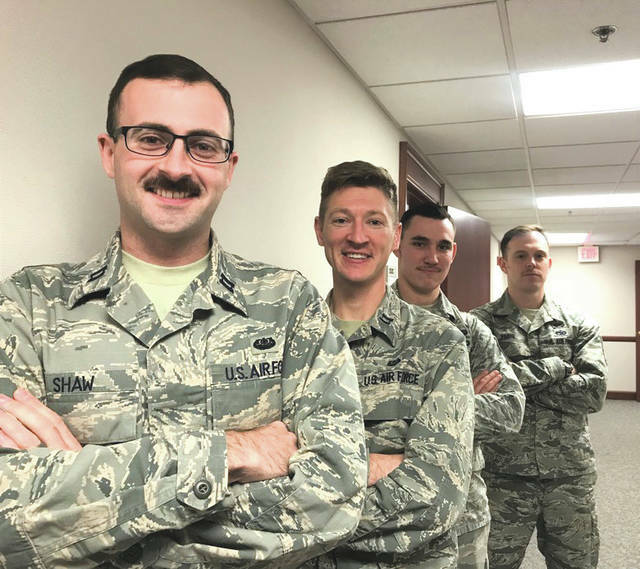 WRIGHT-PATTERSON AIR FORCE BASE — Movember is an annual event of growing mustaches during the month of November to bring awareness to men’s health issues such as prostate, testicular cancer and mental health. Whether you grow the “Trucker”, “Rock Star” or the “Connoisseur” mustache, growing one with friends, family and co-workers to see who has the best “Mo” can be a friendly competition but it can also be the perfect time to start conversations about something more serious like prostate and testicular screenings. “One in seven men will be diagnosed with prostate cancer and one in 4,000 will be diagnosed with testicular cancer, said Maj. Toby Lees, 88th Medical Group medical director of urology. Lees said prostate cancer is the second most diagnosed cancer among men and the chances increase to one in five for African American men and one in three if there is a family history of prostate cancer. Approximately 180,000 men will be diagnosed with prostate cancer this year. Early in its stages, it is rare to have symptoms of prostate cancer but any symptoms with urinary or sexual function might indicate the need for a referral to a urologist to discuss these issues. Obesity is a risk factor for higher risk prostate cancer. Lees recommends at the age of 50, men should have a conversation with their doctor about testing for Prostate Specific Antigen. African Americans or those with a family history of prostate cancer should begin screening at 45. Screening for PSA is a blood test, which is sensitive but not specific to prostate cancer. This means that an elevation does not necessarily mean someone has cancer however an elevated PSA would prompt a referral to a urologist. Testicular cancer is the most common cancer in young men and although there is a 95 percent chance of survival, the number of those who are being diagnosed with testicular cancer has been increasing over the past 40 years. Risk factors are an undescended testicle at birth, a family history or having had testicular cancer on one side previously. A lump in the testicle is the most common presenting complaint. Discussing prostate and testicular screenings can be an uncomfortable topic to discuss and Maj. Lees said it is natural to fear the unknown and stresses screenings can detect cancers earlier. Lees advises that a discussion with your physician about the risks of over-screening is warranted in a population younger than 50 or without urologic symptoms. https://www.fairborndailyherald.com/wp-content/uploads/sites/50/2018/11/web1_181113-F-ME052-005.jpgSubmitted photo Left to right, Capt. Tim Shaw, Capt. John Lipscomb, Staff Sgt. Dakota Herndon and Tech Sgt. Matt Paris and from the 88th Air Base Wing Judge Advocates office, are growing mustaches in support of Mustache Movember. Movember is an annual event of growing mustaches during the month of November to bring awareness to men’s health issues such as prostate, testicular cancer and mental health.